Dylan & Co.: What the heck? 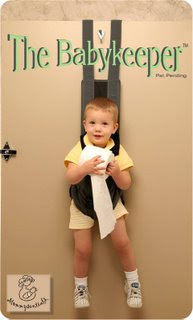 The Babykeeper. It seems like a "good enough idea" but I can just imagine Dylan hanging there, kicking the door (bang bang bang), screaming at me whilst I pee. You said it best: "What the heck?" I like the picture of the kid holding the toilet paper though.